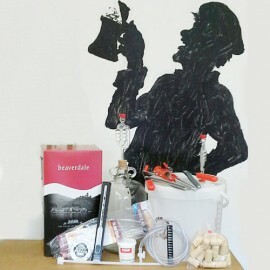 Complete wine starter kit includes all the equipment you need to make and bottle 6 bottles of home crafted wine. Kit includes a 10 litre fermentation bucket, glass demijohn , 2 x airlocks, bung, hydrometer, stick on thermometer, syphon tube, syphon stick, sterilizer, corks and corker. Please note this is equipment only however you can select your wine kit here.